Ask a Londoner about their city and they’ll tell you it’s a many-faced beast. Not a single city, but a web of cultural hubs each nurturing their own collective personality, building creative communities - tribes - which ping back and forth across the tube lines to swap ideas. 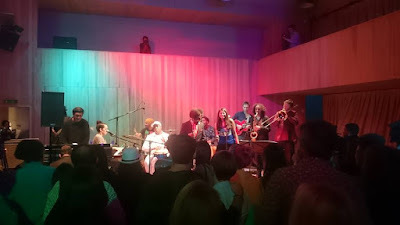 The London Tribes project is a wonderfully well conceived embodiment of London’s musical personality, launched at The Forge Camden with an immensely dynamic evening of musical collaborations and vibrant compositions. Any live music initiative drawing for a stable of performers including Soothsayers, Funkshy and Dele Sosimi is full of promise to say the least, but to see the collective share a stage is immense. Proceedings were opened by South London’s Nomad Collective. With only three songs to make the point, the group made an immediate impression with frenetic, restless beats and pointed, socially minded spoken word. But things stepped up a notch with the introduction of Lokkhi Terra. Remarkably fluid musicianship and rhythmic flair made the band the ideal host for evening’s rotating line up of virtuoso players. Wara’s musical director Eliane Correa was the first introduced, on keys for a feverish party number, before Funkshy’s Debbralee Wells took centre stage, shifting the atmosphere with the deep soul of her voice. Perhaps the most exciting aspect of the London Tribes initiative is the effortless cohesion between the various musicians, their evident knowledge of and respect for each other that made the evening’s performance a writhing mass of musical energy. For all the changes of personnel, the night was undeniably building towards a climax. The appearance of Kodjovi Kush, first as a bassist and then as a vocalist and band leader for Afrospot, signalled another gear shift. An irresistible blend of afro rhythms issued by the legendary Kofi Adu acted as a new catalyst for crowd activity, the audience pressing closer and moving more easily. The undeniable headline feature came with the appearance of the inimitable Dele Sosimi. While all performers on display were of an obvious pedigree, Sosimi’s charisma and gravitas were a level beyond. Dazzling on the keyboard, leading the band with insouciant eccentricity and instructing the audience in dance moves from behind the mic stand. The buoyant, ever-present brass section - featuring at times Soothsayer saxophonist Idris Rahman - was also a significant factor in the mounting party atmosphere. Credit too must go to Geraldo de Armas’ raging bongo playing constantly punctuating the music. The vibrant energy of latin jazz was laid on thick for an initially tentative audience, eventually and inevitably resulting in a wildly packed dance floor. To say it made for a good night would be an understatement. But the really exciting thing is to think this is just the start of this project, a showcase of the talent on offer and the atmosphere the London Tribes team is clearly determined to cultivate at their shows. The talent involved is exceptional. The embodiment of London’s international community is perfect. And the promise of an unprecedentedly thrilling night out, tantalising.